· Open and Three Junior divisions (5-7yrs, 8-11yrs, 12- 16yrs) will be placed 1st-3rd. · Judging criteria-eggs to be uniform in shape, shell, texture, size, color and appearance. When a breed standard has stated a color, variation from this is penalized. Only an entry in this division can qualify for Egg Show Champion. 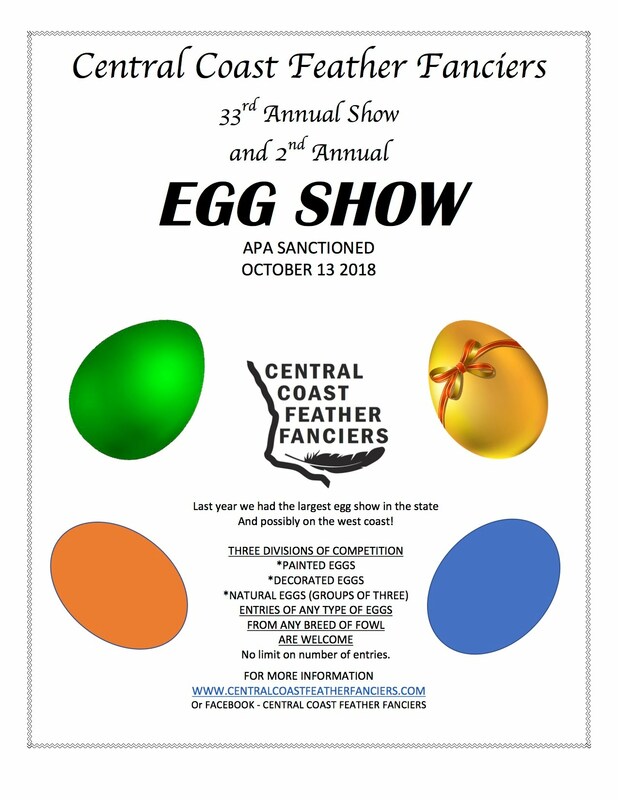 · Entries shall note the breed of eggs even if not an APA recognized. · All Other class is for any other eggs like Emu, Turkey, and Ostrich for example. · Open and Junior (5-7yrs, 8-11yrs, 12- 16yrs). · Entry to be hard-boiled or blown. · Egg may be painted, as well as decorated. · Outline of egg must be recognizable. · Egg Must have been created by the exhibitor. · Egg to be painted or inked. · No decoration may be applied. · Some type of upright support is recommended. Divisions - Main egg competition groups of 3 Open/Jr. 1. Large Eggs – Breed or non-standard noted on entry card. 2. Bantam Eggs - Breed or non-standard noted on entry card. 4. All Other Eggs – If breed is known it can be noted. For all other eggs – Emu, Turkey, ect.